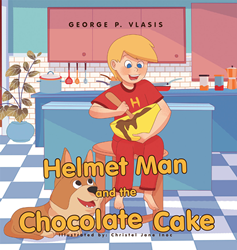 Recent release “Helmet Man and the Chocolate Cake” from Page Publishing author George P. Vlasis captures one boy’s transformation from excited five-year-old George Peter, to his favorite superhero Helmet Man—and the role a bowl of cake batter played in the matter. George P. Vlasis, an elementary school teacher, storyteller, and writer with a master’s degree in early childhood education, has completed his new book “Helmet Man and the Chocolate Cake”: a story meant to make children laugh at a boy’s decisions—and to teach parents to be more understanding of the messes children make along the way. Published by New York City-based Page Publishing, George P. Vlasis’ story follows George Peter, an imaginative five-year-old ready for an adventure. One morning, he sees a bowl full of chocolate cake batter, which would be the perfect special helmet! But his decision results in some superhero chaos for his mom to deal with. The story is accompanied by vivid illustrations to give young readers visual stimulation each step of the way. “Helmet Man and the Chocolate Cake” is available for purchase at bookstores everywhere, or online at the Apple iTunes store, Amazon, Google Play or Barnes and Noble.